The real problem with law schools: Too many lawyers. They train too many lawyers. 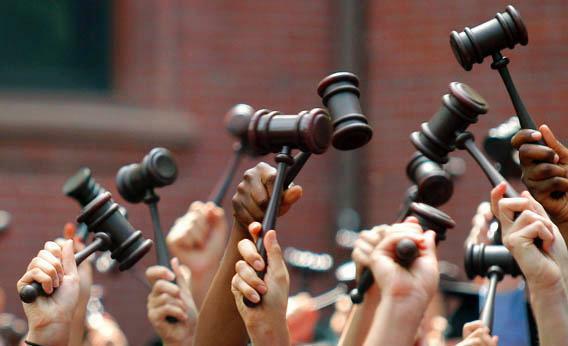 Graduates from the law school hold up gavels in celebration during their commencement at Harvard University in Cambridge, Mass., May 27, 2010. A crisis is looming in legal education. Last month, a notable group of legal educators who call themselves the Coalition of Concerned Colleagues released a letter declaring that law schools have spewed forth more graduates than the legal market can absorb, resulting in rising unemployment among young lawyers, who cannot pay off colossal student loans. As the New York Times recently reported, applications are plummeting, and a movement is on to reduce law school educations from three to two years—advocated in the New York Times by law professor Samuel Estreicher and law dean Daniel Rodriguez. The CCC letter similarly argues that legal education should be less expensive and less uniform, which sounds fine in the abstract. But in the details, the proposed fixes will make the crisis worse than ever. The figures are grim, and the human cost is real. Ninety-two percent of 2007 law school graduates found jobs after graduation, with 77 percent employed in a position requiring them to pass the bar. For the class of 2011 (the latest class for which there are data), the employment figure is 86 percent—with only 65 percent employed in a position that required bar passage. Preliminary employment figures for the class of 2012 are even worse. The median starting salary has declined from $72,000 in 2009 to $60,000 in 2012. A while back, the Bureau of Labor Statistics estimated that 218,800 new legal jobs would be created between 2010 and 2020. As law professor Paul Campos points out, because law schools graduate more than 40,000 students per year, those jobs should be snapped up by 2015—leaving only normal attrition and retirement spots left for the classes of 2016 to 2020. Meanwhile, tuition has increased dramatically over the last several decades. Students who graduate from law school today with $100,000 or more in debt will default on their loans if they cannot get high-paying work in the law. The crisis could have been predicted. Demand for legal services boomed in the 1990s and 2000s. College graduates, drawn by skyrocketing pay and subsidized by government-guaranteed loans, flocked to law school in ever greater numbers. Law schools, rational market actors that they are, hiked tuition. The higher prices people were willing to pay for legal education encouraged universities to enlarge classes and open additional law schools. Not surprisingly, supply overtook demand. The mismatch is now exacerbated by the development of technological substitutes for some legal work, including online services that enable people to fill out legal forms, and a weak economy. The “crisis,” then, is just part of the normal cycle of the economy—familiar to anyone who has held a job as construction worker, software engineer, salesman, or journalist. And the market is reacting in a predictable way. Fewer people are applying to law schools; class sizes are shrinking; some law schools may shut down. The excess supply of lawyers will reduce the price of legal services—a boon for everyone outside the legal sector—and so some lawyers will leave the profession for early retirement or more lucrative pursuits. (We seem to have forgotten the usual complaint about lawyers that they charge too much, not too little.) Demand and supply will eventually equilibrate, and the legal services market will look something like it did 10 or 15 years ago. None of the proposals for reform advocated by CCC make sense in light of the group’s diagnosis of the problems lawyers face. Consider the argument to reduce law school from three to two years, by relaxing the American Bar Association’s standards for accreditation. This would make legal education cheaper. But if there are already too many lawyers who cannot pay their debts, then lowering the bill for newcomers will, by encouraging more of them to join the profession, make the problems of the existing underemployed worse. And in the year of transition, a switch from three to two years of school would also unleash an additional 40,000 graduates into the market, on top of the 40,000 already in the three-year pipeline, swamping them in a flood of new competitors. Critics also argue that law schools train students badly—for example, they provide students with insufficient clinical instruction. But clinical training is more expensive than classroom training, so if clinical training increases, so would the cost of law school as well as the debt students take on. Some law schools fudged their employment statistics in order to attract applicants—and they should be condemned for it. But this is a small part of the problem. Other critics fault the government, arguing that student loan subsidies inflated a law services bubble just as housing loan subsidies inflated the housing bubble. The federal government guarantees loans for legal education. As a result, private creditors have no reason to deny loans to law students who may earn too little to pay them off. This artificial reduction in the cost of credit results in an excess of lawyers. The traditional rationale for government guarantees of student loans is that people cannot easily borrow against future pay. Maybe this is wrong; maybe it is right—but you can’t blame government subsidies for the plight of young lawyers. Government guarantees lower the cost for lawyers to obtain training. If the subsidies create a larger supply of lawyers, it should also create a greater demand for their services, by reducing the costs that they pass on to clients. Depriving students of government-guaranteed loans is hardly a solution to the problem that legal education is too expensive. What about the debt burden? When people take on too much debt and cannot repay it, they lose the incentive to work, and this becomes a drag on the economy as well as a hardship for them. Bankruptcy is the normal solution, but government-guaranteed student loans cannot be erased in bankruptcy. It may make sense to relax this rule during periods of economic distress—and the government has, in fact, responded with a limited loan forgiveness program. Whether this is a wise policy on balance is an open question. In the long run, loan forgiveness will encourage more people to enter law school despite the saturated market. They’ll know that if they do not strike gold by securing a high-paying job, they will be partially protected from the downside. If oversupply is the problem, loan forgiveness is not the solution. A better argument, which really has nothing to do with the current crisis, is that excessively strict or rigid accreditation standards deprive the public of low-cost legal services. Maybe so, but it is important to remember that proposals to create a two-year curriculum and other fast-track routes to the bar will mainly help clients by reducing the cost of legal services. It’s a worthy goal that’s of no help to struggling lawyers. The new opportunities the fast tracks will open for aspiring lawyers will be low-paying ones. Incoming students would take on less debt, but they would also earn less money to service it. If students today have unwisely invested in high-cost legal education that does not enable them to pay their debts, then students tomorrow will unwisely invest in low-cost legal education that will not enable them to pay their debts. The only realistic way to help lawyers today is to increase the demand for legal services—somehow convincing governments, for example, to pay for adequate representation of indigent defendants—but in the long term, greater demand will create the expectation of yet more job growth, and that could lead to another bust. The critics seem to think the legal profession can escape the logic of the market. It can’t.